"Je t'écris, Stéphane, pour partager un pur moment de grâce dont tu est l'heureux responsable. Je trempe actuellement mes lèvres dans une divine liqueur: ton Li Shan du printemps 2007. Un an et demi sont passés mais n'ont pas altéré cette douce magie que ce thé me procurent. Les mots me manquent pour en parler mais il faudrait être Dante ou Virgile pour décrire ce qui se passe en moi. Hélas, oh grand hélas, les feuilles de cette déesse du thé se font plus que rares et cette année n'aura pas étè clémente pour ce thé. J'ose pour autant espérer qu'il se retrouvera sur ta carte l'année prochaine et rêvons même cet hiver d'une qualité aussi irréprochable même s'il faut y mette autant que pour un Da Yu Ling. Un grand merci en tout cas pour ces très grands moments ce thé est (était) exceptionnel. Tiens moi au courant de la tournure des événements pour la suite... De grâce !" Merci pour ce gentil feedback. Après un printemps pluvieux, nous espérons maintenant que les typhons d'automne vont maintenant laisser Taiwan tranquille. Côté température, c'est aujourd'hui le premier jour où je n'ai pas allumé l'air conditionné dans mon appartement. Les récoltes d'hiver en haute montagne se déroulent traditionnellement début novembre. Cela nous laisse un mois pour retrouver de bonnes conditions. Ensuite, il me faudra un peu de temps pour tester les nombreux échantillons, faire mon choix, prendre les photos, écrire les articles. Je pense pouvoir vous informer fin novembre/début décembre. Croisons les doigts! My first package from Stéphane has arrived. I ordered two varieties of Baozhong, a gaiwan and fair cup, and two singing cups. The package arrived with those plus a third singing cup, a sample of bamboo charcoal, and a sample of an oolong. Tonight I tried the singing cups, which enchanted me from the moment I opened the package. They are more green than they looked in the photos on my monitor, and are exactly the shade I was looking for. My limited knowledge of celadon comes from the Korean and Chinese collections at the Minneapolis Institute of Arts, and I know that the exact shades I've seen there have never been replicated by modern technology. I've been frustrated in looking at commercially available celadon cups, which tend to be much heavier in material, color, and overall feel than I was expecting. These singing cups are what I thought a modern celadon cup would look like after all my museum ogling. The cups are beautifully thin, so that my fingers appear in sharp outline when I hold the cup near a lamp, and the perfect size for someone like me who prefers a larger cup but has tiny hands. I drink mostly green teas, which go well with a thin porcelain cup. The shape is easy to hold and drink from. These cups make everything put in them look better -- water looks like nectar of the gods. 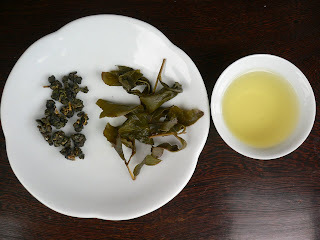 Tonight I brewed some of the Lung Ching I have on hand (listed as Dragonwell, Wild Mountain on teasource.com, my local tea shop). This tea liquor varies from pale yellow-brown to pale yellow over the course of the infusions (I generally infuse this leaf or 5 times with the first infusion at 180F), or at least it does the way I make it. (It should be noted that I'm a novice working with greens.) It is hard to describe how the singing cup affects the color of this tea; the simplest way to put it is that the tea as it appears in the singing cup looks exactly like it tastes. I'd been using western-style porcelain teacups since those were what I had on hand and thinner than any of the Chinese-style cups I'd seen yet. Now that I have the singing cups, my western-style cups may not see much use for a while. Thank you, Stéphane. Having an expert find the right cups certainly turned out well for me. The gaiwan is the perfect size for my daily use; 200 ml would be too large, 100 ml too small. Again, I'm very pleased with the thinness of the porcelain and it's silken finish -- much better than any gaiwan I was able to find locally. I'm particularly pleased with its aspect ratio; this gaiwan is shorter and wider for its volume than others I've seen either locally or online. I like a shorter, wider infusing vessel for the green teas I've been drinking. The wide gaiwan gives me much better access to the leaves than a pot does, which is very useful for one still in the first stages of developing a feel for the leaves. 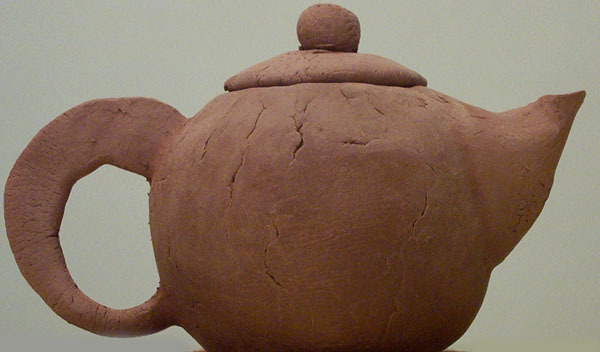 Now I just need to learn to pour from it without winding up wearing the tea. L'arrangement des feuilles de droite me fait penser à 1 calligraphie ! J'ai aussi déballé ma commande et je me régale du tuo cha de 2002 , j'ai aussi pu reprendre les feuilles le lendemain , elles ont supporté encore 4 infusions ! Thank you Laurie and Ginkgo for your kind and positive feedback.